“The Starry Night” by Vincent van Gogh has always been one of my favorite paintings. Throughout college my dorm room was adorned with a poster of this art work. It was an unexpected joy to find it on display at MoMA last week. Mounted by itself on a divider wall in the middle of the gallery, it was mobbed. Dozens of people crowded in front of it. Many were taking pictures. A lone security guards stood beside it. Big and burly, his presences generally held the throng at bay. That and the occasional word remonstrated any overeager art patron. As art police gigs go, this one was a tough one to hold. My viewing was hardly the quiet and contemplative experience that one would hope for, but I was able to jostle myself close enough, with camera held high, and get the pic. 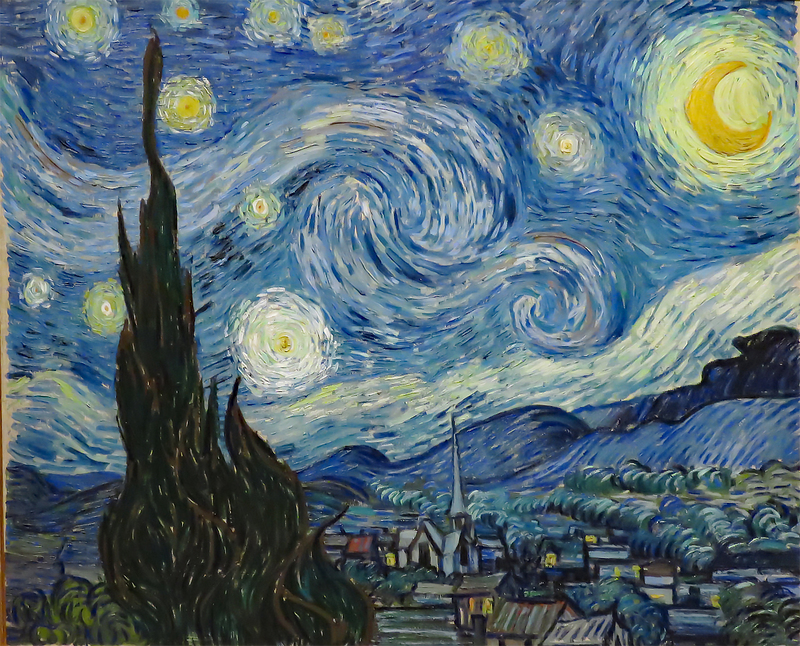 “Starry Night” captured the view from Van Gogh’s east facing asylum bedroom window. This morning, from our own bedroom window, Anne pointed out to me an astronomical conjunction involving Venus and the Moon, all backlit by the first light of the rising sun, our own little starry night. Since my return from New York, I have been rising before dawn with her and giving her a ride to school. The reason for this is that the battery died on her car the night that I returned. She had to walk home that night, like she has been doing ever since. I took MetroLink from the airport and Anne later picked me up in the Prius. Anne’s car is 22 years old, its license is up for renewal soon and it has been under a DNR order for some time now. We jumped her car to just get it home, but it has sat in front of the house ever since and again the battery is dead. We had planned to become a one vehicle family soon anyway. This unfortunate occurrence simply advances our schedule a couple of months. We’ll jump her car once more and this time drive it a little further and see if it can hold onto a charge this time, but come January it will become an NPR donation. We might later buy a new car, either to supplement of replace the Prius, but for now it looks like our carbon footprint will be shrinking. Anyone want a bike roof rack? This entry was posted in Art, Photography and tagged MoMA, NYC by RegenAxe. Bookmark the permalink.